FA: Brody Greer and Bryan Bird, 2008. A nondescript tower between Uncertain Fates and Cowboy Bob. Rope up at the base of the south face and climb four or five pitches to reach the last pitch or hike up around the southeast side of the tower and rope up for the final pitch only. The lower pitches are worth climbing. The final pitch has the runout climbing. Rack: 2 ea to 4”, 1 ea 5.5”, a few nuts that the chock slides for bolts with missing hangers on the final pitch or bring some hangers to leave behind for everyone else. Descent: down climb from the summit back to the only little tree up there. Do one rappel with 60m rope and hike down and east around to the front of the tower. 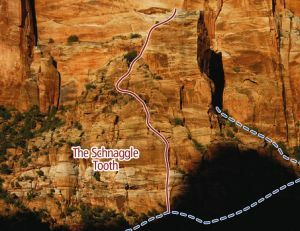 Which SuperTopo guidebooks include a topo for Schnaggle Tooth?